Blizzard Warnings and 26.1 inches of snow in April - a heat wave 5-6 weeks later? Makes perfect sense, if you live in Minnesota. Land of 10,000 Weather Extremes. One thing I've learned, the hard way: when weather swings too far in one direction, the "correction" can be just as extreme, in the other direction. I hope I remember how to sweat. week. I don't see any significant relief from the heat & humidity until the following weekend (June 2-3) when Canadian air finally drifts south. Until then our weather will be a hot mess. And many of us are OK with that. 3-4 inch rains soaked Martin County early Thursday and a few storms later today may turn severe, especially western counties. Monday may be the first 90-degree Memorial Day high at MSP since 2006. I hope you can evacuate to your favorite lake or pool. A tropical system may stall over the Gulf Coast for the better part of 5 days, with persistent rains and potentially serious flooding near from New Orleans to Pensacola. Slight Severe Storm Risk. The best chance of 1"+ hail and winds over 58 mph is forecast to emerge over western and northern Minnesota later today as a squall line fires up, fueled with dew points in the mid to upper 60s. Map credit: NOAA SPC. Heaviest Rains Up North. NAM model guidance predicts some 1"+ downpours with a few waves of thunderstorms between now and Saturday night, with the best chance of getting wet from the Minnesota Arrowhead to the Red River Valley. 00z NAM prints out a whopping .07" rain over the next 84 hours. My semi-educated hunch (spidey-sense) is that we will see a hot/dry summer vs. cool/wet. Map credit: pivotalweather.com. We continue to watch a broad area of low pressure near Belize that could form into a tropical system as it moves into the Gulf of Mexico this weekend. Right now the National Hurricane Center has probability of formation at 60% over the next five days. Whether or not this becomes a named system, we will be watching the threat of heavy rain across a good portion of the Southeast for the Memorial Day weekend. Rainfall totals of at least 4-7” will lead to the potential of flooding through the weekend into early next week. Watching A Potential Tropical System. The National Hurricane Center (NHC) continues to watch an area of low pressure near Belize that will continue to move toward the Gulf of Mexico over the next several days. 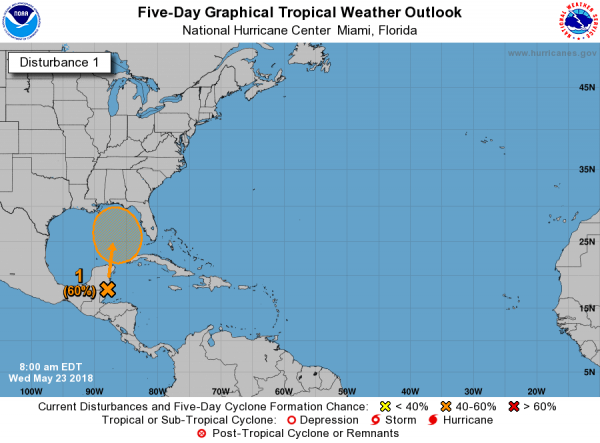 This system has a very low chance (0%) of becoming a tropical or subtropical system in the next two days due to hostile atmospheric conditions as well as its location near the Yucatan Peninsula. However, once this system does move into the Gulf of Mexico toward the weekend conditions will become more favorable for some development. Due to that potential, this system has a 60% probability of formation in the next five days according to the NHC. Heavy Rain Threat. Whether or not this system becomes a named tropical or subtropical system, heavy rain is expected through at least the Memorial Day weekend across the Southeastern United States. 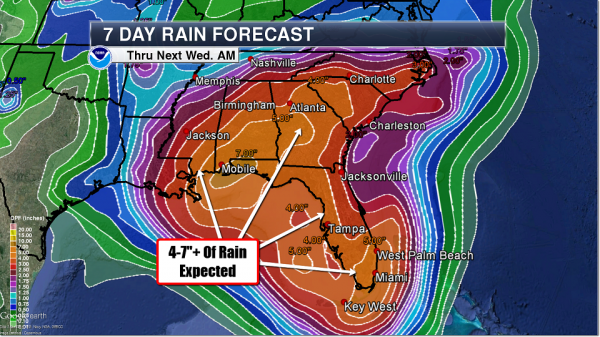 Significant rainfall amounts of at least 4-7” are expected across the Southeast over the next seven days, with most of this falling as that potential system moves onshore. Especially across areas that have received heavy rain over the past 1-2 weeks we will have to watch the threat for flooding through the weekend into early next week. Summary. We continue to watch the potential of a tropical or subtropical system forming in the next several days in the Gulf of Mexico. As of Wednesday morning, probabilities sat at 60% of this occurring as we head into the weekend. Whether or not this system forms, the main story with this system will be heavy rain due to another surge of tropical moisture across the Southeastern United States as we head toward the Memorial Day weekend. This heavy rain of at least 4-7” over the next seven days could spark the potential of flooding, especially near the coast. We will continue to keep an eye on this potential system, as well as the heavy rain and flood threat, over the next several days. Early Predictions Suggest More Hurricanes Than Average for 2018 Atlantic/Gulf Season. Here's a clip from Business Insider: "...An average hurricane season is based on the 30-year average from 1981 to 2010. By that definition, an average season includes 12 named storms and six hurricanes, with three of those being major hurricanes — storms that qualify as category 3 or higher on the Saffir-Simpson scale. The researchers at Colorado State's Tropical Meteorology Project issued their extended range forecast for the 2018 season on April 5, predicting 14 named storms. Of those, they forecast seven hurricanes, three of which could be major. The Weather Channel's early predictions suggest a more average year, with 13 named storms and six hurricanes, two that qualify as major hurricanes. A team at North Carolina State announced April 16 that it predicted 14 to 18 named storms, seven to 11 of them hurricanes. Of those, the team expects three to five to be major..."
Incredible New NASA Images Show Puerto Rico's Forests Still Scarred from Hurricane Maria. Here's a clip from a story at Earther.com: "We’re 10 days out from the 2018 hurricane season, but if a new NASA-led aerial survey is any indicator, Puerto Rico’s forests and wetlands still have a long way to go before they’ve recovered from the last one. In April, a NASA science plane flew across a vast swath of Puerto Rico’s ecosystems, from tropical rainforests in the northeast to dry forests in the southwest. A follow-on to a similar mission conducted last spring, the goal was initially to track long-term forest regrowth after land abandonment. Hurricane Maria changed all that. Instead of focusing on land use change, the research flights—whose G-LiHT instrument system included LiDAR and more—became the first large-scale, multi-sensor aerial survey of the island after the Category 4 storm that struck last September..."
Minnesota Native Leading Weather Warning Revolution. A story at KSTP.com caught my eye: "...What we're trying to do here is minimize the false alarm," Rothfusz said. "And you get to the point that when the message that this tornado or hail storm is coming to you, it is you we're talking about and not another part of the county that you don't have to worry about." The information would stream in much earlier too. Rothfusz wants to better alert people during the watch period, before a warning is issued and a tornado becomes more imminent. Rothfusz said the information would be targeted down to every two miles, updating every two minutes, creating a constant flow of data for specific locations. He realizes that could lead to an overwhelming amount of information, so researchers are trying to find a balance..."
Debunking The Most Common Tornado Myths. May is the month I worry about allergies, flash floods and Tornado Amnesia. "Paul, you have to understand, I live in the metro area. Tornadoes can't hit here!" I hear this a lot, and it's just not true. Tornadoes can hit cities, cross lakes and rivers, even track across mountain ranges. If the circulation of heat and moisture swirling into a rotating "supercell" T-storm is strong enough, there is no reason why a large tornado couldn't hit a downtown. It's happened across the USA, multiple times. On May 22, 2011 an EF-1 tornado packing 110 mph winds tracked 14 miles, from St. Louis Park to North Minneapolis. It was up to half a mile wide. It's good to be prepared (and perpetually paranoid). Lava Enters Hawaii Power Plant, Rising Deadly Gas Release. The Daily Beast has harrowing details: "Lava from Hawaii’s Kilauea volcano entered the grounds of a nearby geothermal power facility Monday, threatening the plant’s sealed-off wells and potentially triggering a catastrophic explosion and an “uncontrolled release of hydrogen sulfide or other potentially dangerous volcanic gases,” the Honolulu Star Advertiser reports. Workers were particularly concerned about a deep geothermal well that was difficult to seal off as lava advanced within a few hundred yards of a well pad area. Facility employees have been attempting to “quench” the wells—or pumping cold water into them to trap the gases—but the contents of one close to the lava were heating up despite their efforts..."
It's Been 5 Years Since the Last EF-5 Tornado Hit the U.S. The Weather Channel has details: "It's been five years since the last catastrophic EF5 tornado struck the United States, occurring in Moore, Oklahoma, on May 20, 2013. Tornadoes assigned an EF5/F5 rating have historically been rare, but when they do strike, the damage in the affected communities is devastating. Since 1950, a total of 59 tornadoes have been rated EF5/F5, an average of less than one per year, according to NOAA's Storm Prediction Center. 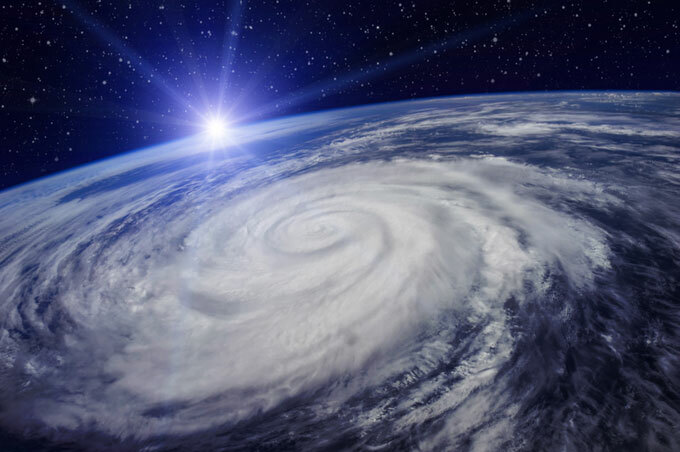 The frequency has ranged from several tornadoes rated this magnitude in a single year to multi-year periods with none..."
NOAA Addressing Performance Issue on New Weather Satellite. Can we get someone up there (stat) to fix this? KGAN-TV has details: "During on-orbit testing, the National Oceanic and Atmospheric Administration (NOAA) has encountered a problem with the cooling system on the Advanced Baseline Imager (ABI). The ABI is the 'camera' that takes the satellite images from geostationary orbit over 22,000 miles overhead. The cooling system is necessary, and without it, the infrared and near-infrared channels will be impacted. Those channels make up 13 of the 16 products on the ABI. The visible channels are not impacted..."
Image credit: "GOES-17, formerly known as GOES-S, is experiencing a cooling issue on the imager." What Are Weather Models, Exactly, And How Do They Work? Capital Weather Gang has a great explainer; here's an excerpt: "...The foundation for models are mathematical equations based on physics that characterize how the air moves and heat and moisture are exchanged in the atmosphere. Weather observations (pressure, wind, temperature and moisture) obtained from ground sensors and weather satellites are fed into these equations. The observations are brought into the models in a process known as data assimilation. In a model, the atmosphere is divided into a three-dimensional grid and each grid point is given the assimilated data. These are called initial conditions. Then at each grid point, the mathematical equations are applied and stepped forward in time. The outputs over many time steps specify future weather at all grid points. The two most well-known weather models are the European Center for Medium-Range Weather Forecast (ECMWF) model and the National Weather Service’s Global Forecast System (GFS) model..."
Image credit: "European model showing a simulation of Hurricane Sandy in October 2012." (WeatherBell.com). Leveraging Global Air Quality for Business. I wrote a post for one of the weather-tech businesses I'm involved with, AerisWeather. Here's an excerpt: "An old joke insists that Californians don’t trust air they can’t actually see. Unfortunately, air pollution is no laughing matter. According to recent research, more than 95% of the world’s population breathes unsafe air, contributing to more than 6 million deaths worldwide in 2017. In the US alone studies suggest 7,000 to as many as 200,000 premature deaths occur annually as a result of unhealthy air. At this rate, a conservative estimate can state that air pollution claims as many lives as traffic accidents each year. The statistics are staggering, but the first step is understanding. Air pollution is measured by what is generally known as an Air Quality Index (AQI). This measurement is an overall assessment and weighting of 6 main pollutants pm2.5, pm10, no2 (nitrogen dioxide), co (carbon monoxide), so2 (sulfur dioxide), and o3 (ozone). If you don’t know what these mean you are not alone..."
EPA Bars AP, CNN From Summit on Contaminents. AP has the latest: "The Environmental Protection Agency is barring The Associated Press, CNN and the environmental-focused news organization E&E from a national summit on harmful water contaminants. The EPA blocked the news organizations from attending Tuesday's Washington meeting, convened by EPA chief Scott Pruitt. EPA spokesman Jahan Wilcox told the barred organizations they were not invited and there was no space for them, but gave no indication of why they specifically were barred. Pruitt told about 200 people at the meeting that dealing with the contaminants is a "national priority." Guards barred an AP reporter from passing through a security checkpoint inside the building. When the reporter asked to speak to an EPA public-affairs person, the security guards grabbed the reporter by the shoulders and shoved her forcibly out of the EPA building..."
Photo credit: Andrew Harnick, AP. Ridgedale Center Now Has a Solar Panel Rooftop. Details via Sun Sailor: "Ridgedale Center recently unveiled a newly-built solar panel installation on its rooftop that will reduce the mall’s electrical consumption by about eight percent. The energy saved by the panels is equivalent to gas emissions of 155 passenger vehicles or the amount of energy used by 109 homes in Minnesota. The installation will have more than 812 kilowatts of solar generation capacity with a projected annual production of 975,000 kilowatt hours. It is part of Ridgedale’s larger energy sustainability initiative..."
What is Going on in Sweden? CNN has details: "Sweden's ready for war -- whenever it may break out. The government there is sending out "war pamphlets" to its 4.8 million households, informing them of the perils of battle. It's the first time Sweden's done this since the 1980s. Why now? Russia, apparently. The Russians have allegedly violated Swedish airspace and territorial waters, so there's serious discussion in the country about joining NATO. Sweden has also increased defense spending, reintroduced the draft and put troops on the strategically important island of Gotland..."
Amazon is Selling Real-Time Facial-Recognition Technology to Police for Wide-Net Surveillance. Big Brother, brought to you by Big Think: "The North Carolina Civil Liberties Union has obtained documents that show Amazon has been nearly giving away facial recognition tools to police departments in Oregon and Orlando in an effort to essentially beta test the tools, which live in the cloud via Amazon Web Services. The package is called Rekognition and has been deployed in some capacity—including alpha and beta testing—since late 2016. Today, a coalition of civil rights groups has jointly signed a letter that calls for Amazon to stop selling this technology..."
Scratch and Sniff Stamps Coming Soon. Oh, thank God. USA TODAY explains:"Ah, the sweet smells of summer: freshly cut grass, barbeque on a grill, the beach and suntan lotion. Now add stamps to that list. The U.S. Postal Service said Monday that it will issue its first-ever scratch-and-sniff stamps that will aim to evoke the sweet scent of summer. The 10 different stamp designs each feature a watercolor illustration of two different ice pops on a stick. There will be one scent for all of the stamps and the secret smell will be unveiled when the Postal Service issues the stamps on June 20, according to U.S. Postal Service public relations representative Mark Saunders..."
An Actual Sinkhole Has Opened on the White House Lawn. It's Growing. A sinkhole is growing on the north lawn of the White House grounds. How's that swamp-draining thing going? Quartz explains: "...Often described as a “swamp” of corruption, parts of the city of Washington, DC, are also literally built on a swamp. The city’s geological issues also include “forebulge collapse,” a post-Ice Age condition that means the city could sink as much as six inches this century. Sinkholes have opened up across the city in recent years. They forced two residents to abandon their homes in March, and swallowed up a school bus last year. This is the first report of one on the White House lawn. Last year, a giant hole opened in the earth in front of Donald Trump’s Florida resort, but that was due to a new water main, not a geological condition..."
Weather Nerd Chic. No, I didn't invent these - I went online and bought them. Check out the meteorological footwear at Helicity Designs. 84 F. high temperature yesterday in the Twin Cities. 71 F. average high on May 23. 61 F. high on May 23, 2017. May 24, 1925: After seeing a high of 99 degrees two days earlier, the Twin Cities picks up a tenth (.10) of an inch of snow. May 24, 1908: Tornadoes hit the counties of Martin and Blue Earth. "Extreme Zombie Activity". Can't make this stuff up. AP reports: "Residents of a Florida city who received alerts about a power outage were also warned to look out for zombies. That’s right — zombies. The Palm Beach Post reports that Lake Worth residents received the message during a power outage Sunday. The alert warned that more than 7,000 customers lost power “due to extreme zombie activity.” City spokesman Ben Kerr later posted a Facebook message saying officials were investigating the bogus alert and that he wanted to “reiterate that Lake Worth does not have any zombie activity currently.” Kerr says 7,880 customers lost power, but it was restored within 30 minutes. He did not mention what really caused the outage..."
Meet NASA's New Dynamic Duo: A Pair of Climate Change-Tracking Satellites. Smithsonian Magazine has the story: "Today, NASA successfully launched a pair of satellites collectively known as GRACE-FO (Gravity Recovery and Climate Experiment Follow-On mission) as a replacement for the two GRACE satellites currently in orbit. Launched in 2002, GRACE helped provide a better understanding of many of Earth’s most pressing conditions, including rising sea levels, melting ice sheets and droughts. But last year, after 15 years of service, the original GRACE duo completed its mission. The new satellites will continue GRACE’s work, but feature updated tech, including improved batteries and an extra camera. The pair will map out changes in Earth’s gravitational field, which scientists use to monitor distribution of water on the planet’s surface..."
Something Stirs: What Will Happen as Permafrost Melts? Discover Magazine has the post; here's an excerpt: "...And the worst is yet to come. Organic matter trapped in permafrost — everything from mammoth carcasses to ancient fruit — contains massive stores of carbon, an estimated 1,500 billion tons, or nearly twice the carbon currently in the atmosphere. As the ground warms, the long-frozen material will decay and release the carbon as greenhouse gases. “The more carbon we have in the atmosphere, the more warming we have, and that creates a feedback,” says Northern Arizona University ecologist Christina Schädel, who coordinates a global network of scientists studying the impact of permafrost thaw. As researchers scramble to predict the effects of climate change on permafrost, Arctic people are already witnessing it, right beneath their feet..."
Photo credit: "Erosion along the Arctic coast in Alaska’s Teshekpuk Lake Special Area lays bare pale permafrost just beneath the ground’s surface. Caused by the disappearance of sea ice, the rapid erosion is one of several problems in the area caused by climate change." Brandt Meixell/USGS. Former EPA Head Gina McCarthy: The Climate Change Message Is All Wrong. At the end of the day this isn't about polar bears. This is about our kids, and their kids. What responsibilities do we have today? Here's an excerpt from a Boston Globe post: "...In addition to declaring war on confusing jargon, she calls for a wholesale recasting of the climate-change argument, which is clearly not reaching the people it needs to persuade. She wants to move the focus away from plants, animals, and the health of the planet, and toward the dire threat that global warming and pollution pose to the well-being of children. “I’m tired of climate change being projected as polar bears, or EPA being looked at as the birds-and-bunnies agency,” she says. “I work for children, for human beings.” Earth, she says, will be fine no matter what happens. Planets are survivors. Our main concern should be the ability of our descendants to thrive here..."
Photo credit: Webb Chappell for The Boston Globe. “Whoever wins in the clean energy race is going to be the strongest country in the world,” says Gina McCarthy, a Massachusetts native who headed the EPA during the Obama administration." Harvard Overseer Resigns in Protest Over University Endowment, Fossil Fuel Investments. HuffPost has the story: "A member of one of Harvard University’s governing bodies resigned Tuesday over ethical concerns surrounding the school’s multibillion-dollar endowment, including investments in fossil fuels, an action that some environmentalists described as a “powerful act of conscience.” With just one day left on her six-year term on Harvard’s Board of Overseers, Kathryn A. “Kat” Taylor resigned in protest over what she described as the university’s failure to adopt ethical commitments tied to its endowment, according to a letter she sent on Tuesday to the university’s leadership, including incoming president Lawrence S. Bacow..."
Water's Rising Because It's Getting Warmer. No, it's not rocks falling into the sea. Here's an excerpt from The Wall Street Journal: "Would the Journal run the op-ed “Objects Are Falling, but Not Because of Gravity”? That’s pretty similar to climate contrarian Fred Singer saying The Sea Is Rising, but Not Because of Climate Change” (op-ed, May 16). No, ice is not accumulating on Earth—it is melting. No, Antarctica isn’t too cold for melting—warming oceans are eroding the ice from beneath, destabilizing the ice sheet. And no, legitimate scientific conclusions are not reached in op-ed pieces, but through careful peer-reviewed research. 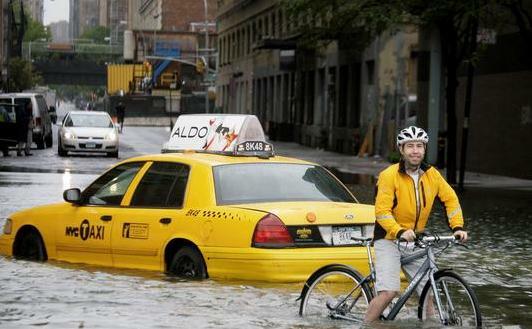 That research shows that sea levels are rising and human-caused climate change is the cause. Don’t take our word for it; help yourself to the mountain of scientific literature showing as much. When water warms, it expands. When ice warms, it melts. To deny these facts is not just to deny climate change. It is to deny basic physics..."
File image: Peter Morgan, AP. "Climate Change is Real", Carmakers Tell White House in Letter. Bloomberg has the story: "Automakers urged the White House to cooperate with California officials in a coming rewrite of vehicle efficiency standards, saying “climate change is real.” The plea came in a May 3 letter to the White House’s Office of Management and Budget from the Alliance of Automobile Manufacturers, the industry’s leading trade group. It said carmakers “strongly support” continued alignment between federal mileage standards and those set by California. General Motors Co., Ford Motor Co., Daimler AG and nine other carmakers are members of the Alliance. “Automakers remain committed to increasing fuel efficiency requirements, which yield everyday fuel savings for consumers while also reducing emissions -- because climate change is real and we have a continuing role in reducing greenhouse gases and improving fuel efficiency,” David Schwietert, executive vice president of federal government relations at the Alliance, wrote in the letter, which was made public Monday..."
Hurricanes, a Bit Stronger, a Bit Slower, and a Lot Wetter in a Warmer Climate. Here's the intro to new research at UCAR in Boulder, Colorado: "Scientists have published a detailed analysis of how 22 recent hurricanes would change if they instead formed near the end of this century. While each storm's transformation would be unique, on balance, the hurricanes would become a little stronger, a little slower moving, and a lot wetter. In one example, Hurricane Ike — which killed more than 100 people and devastated parts of the U.S. Gulf Coast in 2008 — could have 13 percent stronger winds, move 17 percent slower, and be 34 percent wetter if it formed in a future, warmer climate. Other storms could become slightly weaker (like Hurricane Ernesto) or move slightly faster (like Hurricane Gustav). None would become drier. The rainfall rate of simulated future storms in the study increased by an average of 24 percent..."
Florida Cities Are Most at Risk from Climate Change, Study Says. No kidding. Bloomberg has details: "The picturesque Florida cities of Miami Beach and Sarasota carry high investment-grade credit ratings and are popular travel destinations. They’re also two of the most exposed U.S cities to climate change in the country, according to a new analysis by advisory firm Four Twenty Seven. The Berkeley, California-based firm has developed an index surveying 761 cities’ and 3,143 counties’ exposure to sea level rise, water stress, heat stress, cyclones and extreme rainfall based on analysis of changes between current and future conditions. It found that communities in Florida are the most susceptible to climate change risks, with Miami Beach being the most exposed city and Manatee County being the most-exposed county..."
Photo credit: "Miami Beach, Florida." Photographer: Christina Mendenhall/Bloomberg. Millenials Not Brainwashed on Climate Change. Here's an excerpt of an Op-Ed at Star-Telegram: "We’re teaching our kids negative things — we’re pre-biasing them.” Texas Railroad Commissioner Wayne Christian recently claimed the reason Millennials like me care about solving climate change and aren’t elbowing each other for jobs in the oil and gas industry is because our entire generation has been brainwashed. Brainwashed? If true, it’d be a national emergency. After all, who could so effectively organize such an epic conspiracy to brainwash the 91 percent of us who accept climate change is happening? Is it a plot by the Democrats? No doubt Democrats have packaged climate action into a basket of progressive issues. But before this became a polarized issue — a condition unique to U.S. politics — politically active conservatives were more likely than liberals to believe scientists about the human contribution to climate change..."